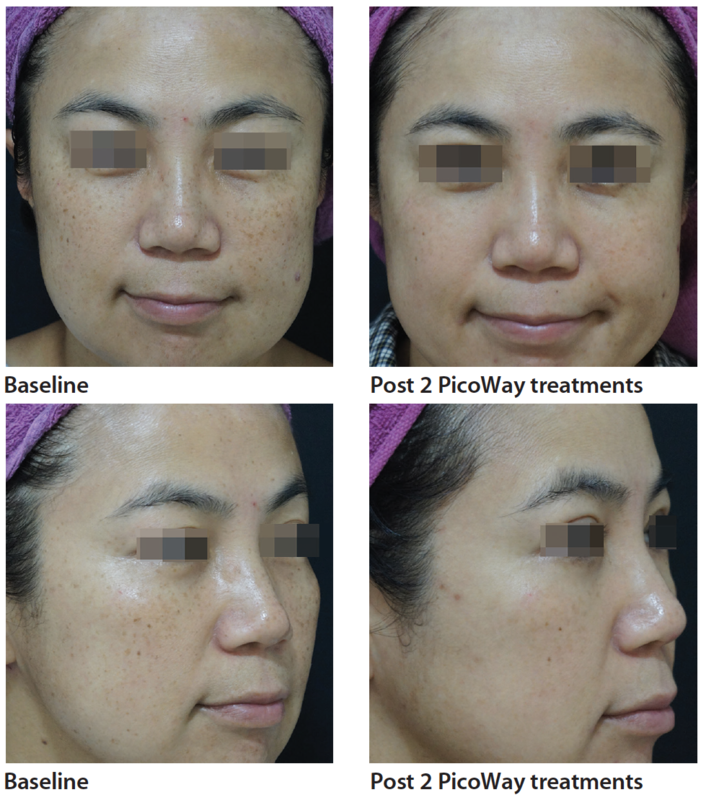 PicoWay picosecond laser system: A primarily photoacoustic, subsurface remodeling therapy that treats pigment-based dermatological disorders and lesions, clears tattoos, and improves skin appearance across Fitzpatrick skin types by handpiece, as outlined below. By 2060, nearly 60% of the US population will comprise people with skin of color,2 demonstrating the need for dermatological interventions that can meet the unique treatment needs and considerations of this growing patient demographic. Due to specific biological characteristics of skin of color, these patients are more prone to certain dermatological conditions, such as melasma; café au lait marks (CALMs); Hori’s nevus (also known as acquired bilateral nevus of Ota-like macules); lentigines; and post-inflammatory hyperpigmentation (PIH). Melasma is increased pigmentation related to hormones (often known to patients as the “mask of pregnancy”), genetics, UV exposure,6 and medications like birth control. Areas of the face typically affected include the upper lip, upper cheeks, and chin. CALMs are pigmented lesions often referred to as “coffee with milk” because of their light brown coloration. These pigmented lesions are present at birth, and are more commonly called birthmarks, and remain throughout life. At birth, a single CALM is observed in only 5% of Caucasians and up to 15% of Americans of African descent,7 further illustrating the biological differences and instances of dermatological conditions in patients with lighter versus darker skin of color. 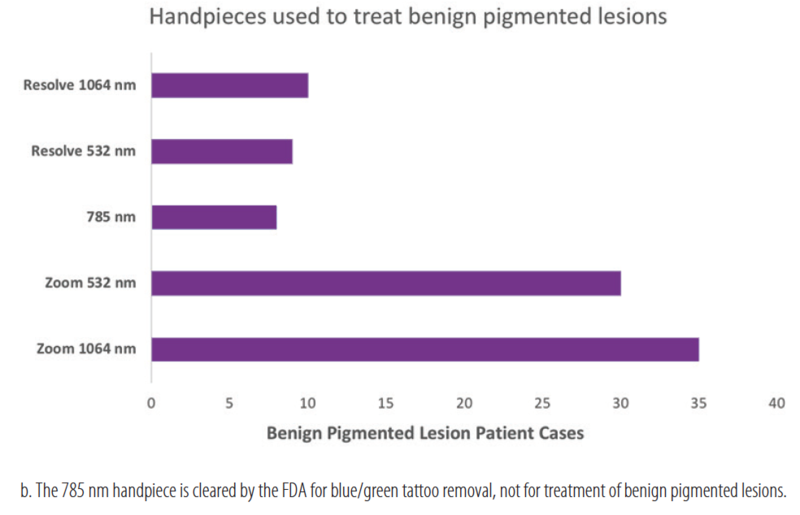 Outside of the advancements in laser therapies, one constant remains: treating benign pigmented lesions and tattoos on patients with skin of color (i.e. Fitzpatrick skin types IV-VI) requires a gentle yet powerful approach to accurately target the melanin or ink, while minimizing adverse side effects such as blistering or scarring that are more common to this patient group in comparison to lighter skin types (ie, Fitzpatrick skin types I-III). When treating patients with skin of color, several considerations must be weighed to provide laser treatments that accurately target the chromophore, a molecular area that provides pigment/coloration, and not the surrounding melanin found in deeper skin tones. • and ideally a laser treatment that requires a small or reduced number of treatment sessions, relative to other laser treatment options, with minimal treatment time and low fluence. The innovative PicoWay picosecond laser system includes multiple wavelengths on one platform: 532nm, 785nm, and 1064nm. 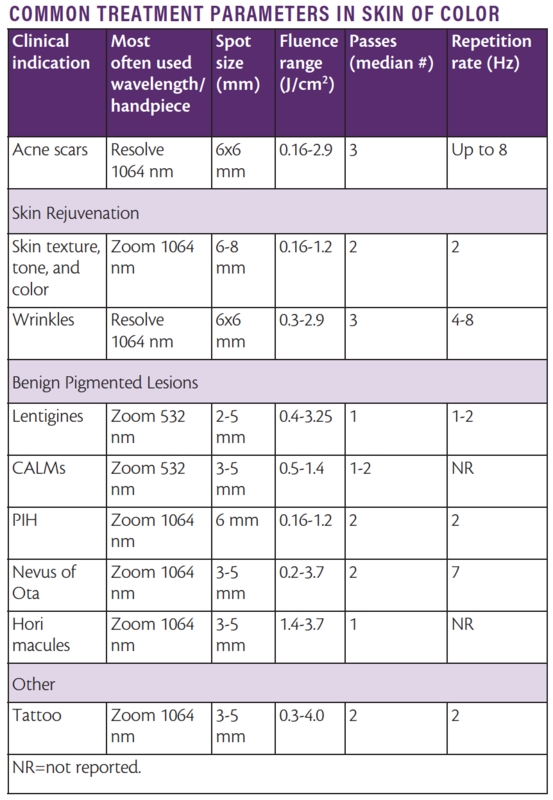 When treating pigmented lesions, the 1064nm and 532nm wavelengths are employed to target and clear chromophores. In tattoo removal treatments, all 3 wavelengths (1064nm, 532nm, and 785nm) may be employed to fraction and help clear away various ink colors. The 532nm wavelength is generally used to address superficial lesions, while the 1064nm wavelength allows for deeper epidermal penetration and can be used on all Fitzpatrick skin types (I-VI). The 1064nm enables users to target deeper lesions and severely photodamaged skin because it penetrates more deeply and initiates a wound response in the dermis. Additionally, the PicoWay Resolve handpieces at 1064nm treats acne scars, and at 1064nm and 532nm, treats wrinkles. The system’s picosecond pulses can be administered with adjustable spot sizes with the 532nm Zoom, 785nm, and 1064nm Zoom handpiece (range from 2mm to 10mm) or with the Resolve handpiece (1064nm and 532nm) with identical split-beams in a 6mm x 6mm profile. 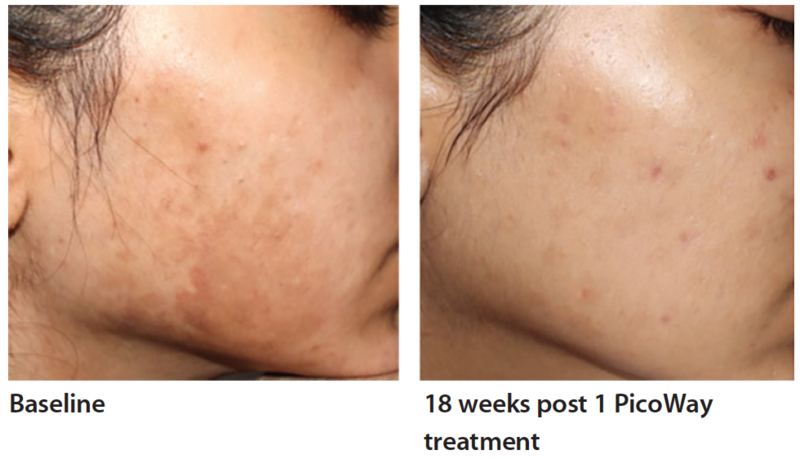 The treatment capabilities of the PicoWay laser system, and the results as seen in the following case studies, are both impressive and promising for treating skin of color. In a clinical study, Asian patients with Fitzpatrick skin types III and IV were treated with the picosecond laser for solar lentigines. 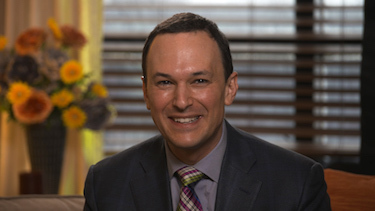 Researchers concluded there were “obvious differences” in epidermal and tissue damage when comparing sites treated using a QS laser with those sites treated with a picosecond laser, by way of histological evaluations. Electron microscopy showed destruction of melanosomes with surrounding tissue damage with the QS laser and without particular damage with the picosecond laser. 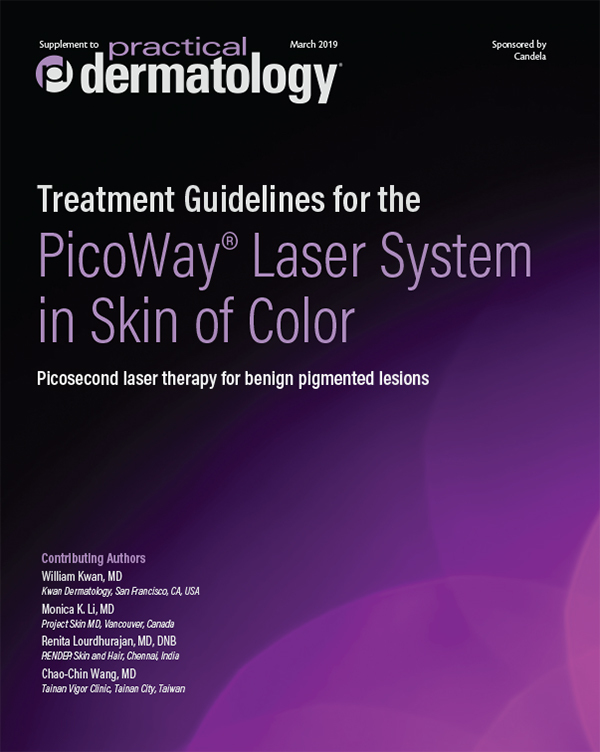 In September 2018, an expert-user panel of 15 physicians gathered to discuss their experiences treating multiple skin conditions in patients with skin of color using the PicoWay laser system. The panel agreed that in order to provide an optimal laser treatment for patients, multiple factors need to be balanced, including patient factors such as skin type and condition; and laser treatment factors such as fluence, diameter, pulse durations, treatment density, and output power. Multiple patient factors play a role in selecting a treatment parameter for each individual patient, thus the settings should be adjusted and customized to individual patient needs. 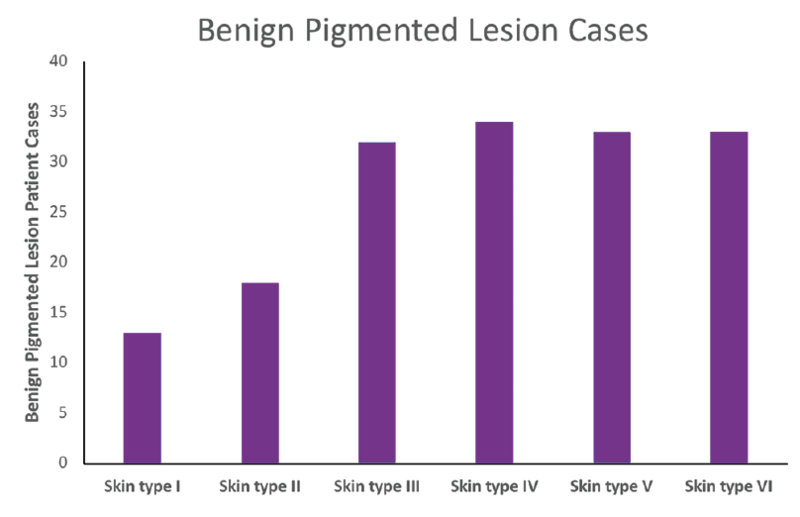 The majority of the cases presented by the expert-user panel focused on the treatment of benign pigmented lesions across Fitzpatrick skin types III-VI. Zoom handpieces were primarily used to treat benign pigmented lesions in patients with skin of color. The Zoom 1064 handpiece, which allows for deeper epidermal penetration and adjustable spot sizes, was used most often. With the 1064nm Zoom handpiece, the 6mm spot size was the most commonly used for skin of color in the presented cases. • Fluence ranged from 0.18 to 6 in treatment of benign pigmented lesions, with an average minimum fluence of 1.2 and average maximum fluence of 1.78 J/cm2. • Utilize the 1064nm wavelength with the Zoom handpiece for most patients, treating 1 to 2 times to address skin conditions such as CALMs and PIH. • A skin care regimen consisting of sunscreen and/or isotretinoin and/or azelaic acid and/or hydroquinone, in the appropriate clinical context, is recommended post treatment. • Utilize appropriate cooling techniques with either lower repetition rate or pausing between passes to reduce heating, making treatments more comfortable for patients. A skin cooling system can also be used to prevent overheating of the skin during treatment. Overall, a picosecond laser with the shortest pulses and low repetition rate was found to be ideal for the treatment of skin of color. The expert-user panel noted several advantages with the PicoWay system, including improved skin texture, low patient downtime, and high patient satisfaction. Patient with Fitzpatrick skin type V treated for solar lentigo using PicoWay 532nm and 1064nm Zoom handpiece with a 1 Hz repetition rate. Using the 532nm wavelength (5mm spot size; 0.6 fluence rate), 4 pulses were administered to treatment site A (left solar lentigo), resulting in total clearance with 1 pass. Using the 1064nm wavelength (6mm spot size; 1 fluence rate), 14 pulses were administered to treatment site B (right solar lentigo), resulting in partial clearance with 2 passes. Adjuvant therapy was azelaic acid 20% and sunscreen. Patient treated for PIH post laser hair removal/chemical peel using PicoWay 1064nm Zoom handpiece with a 6mm spot size, 1.2 fluence rate, and 2 Hz repetition rate. A total of 467 pulses were administered over 2 passes. Patient treated in Taiwan for lentigines (freckles) using 2 treatments with PicoWay 785nmb and Resolve handpieces. The first session was conducted using the 785nm wavelength (2-3mm spot size, 1.6-3.25 fluence rate, 1-5 Hz repetition rate) and the Resolve 1064nm handpiece (6mm spot size, 1.3-2.3 fluence rate, 5 Hz repetition rate). The second session was conducted using the 785nm wavelength (2-3mm spot size, 1.8-2.75 fluence rate, 1-5 Hz repetition rate), the Resolve 532nm handpiece (6mm spot size, 0.83 fluence rate, 5 Hz repetition rate), and the Resolve 1064nm handpiece (6mm spot size, 0.19 fluence rate, 2 Hz repetition rate). From research to patient application, the PicoWay system is a proven laser therapy with excellent implications for patients of darker skin types. 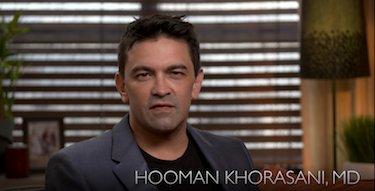 The customizable treatment settings coupled with the dynamic Resolve and Zoom handpieces make for a truly personalized patient experience, tailoring each laser treatment to every patient’s unique dermatological needs. 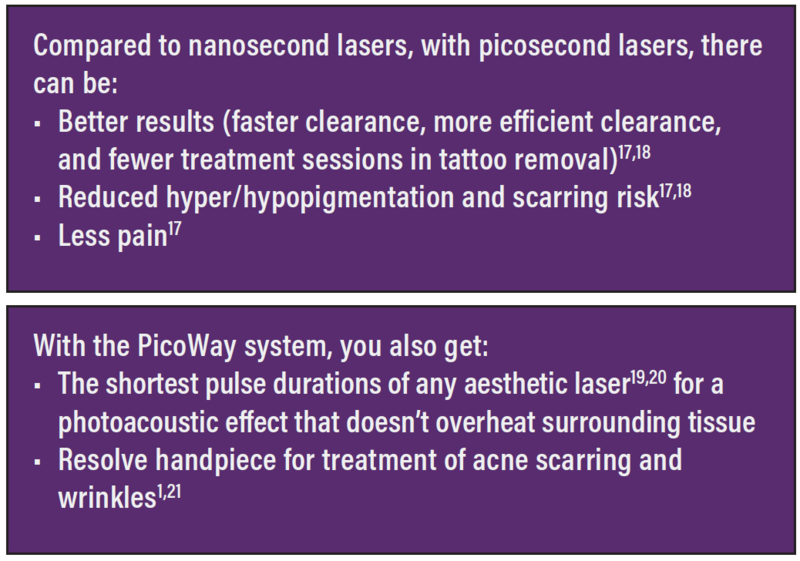 PicoWay technology disrupts the status quo in laser treatments. Now, more than ever, physicians can “remove boldly, treat lightly” across patient skin types, including skin of color. 1. PicoWay 510(k) clearance for wrinkles (K170597), May 2017. 2. Colby SL, Ortman JM. Projections of the Size and Composition of the U.S. Population: 2014 to 2060. US Census Bureau. March 2015. 3. Krah SL. Changing demographics: what does it mean now and in the future? Diverse: Issues in Higher Education. February 27, 2014. http://diverseeducation.com/article/60971/. Accessed May 16, 2018. 4. Torjesen I. Cosmetic needs differ for skin of color patients. Dermatol Times. 2018;(39)6:1-2. 5. Alexis AF. Lasers and light-based therapies in ethnic skin: treatment options and recommendations for Fitzpatrick skin types V and VI. Br J Dermatol. 2013;169(suppl 3):91-97. 6. Skin of color population faces unique, but treatable, dermatologic conditions. American Academy of Dermatology website. https://www.aad.org/media/news-releases/skin-of-color-population-faces-unique-but-treatable-dermatologic-conditions. Accessed October 12, 2018. 7. Aase JM. Diagnostic Dysmorphology. London, New York: Plenum Medical Book Company; 1990. 8. Hale J, Dorton D, van der Kooi K. Acquired bilateral nevus of Ota-like macules (Hori’s nevus): a case report and treatment update. J Amer Ost Col Derm. 2014;30:22-23. 9. Lentigines. The American Osteopathic College of Dermatology website. https://www.aocd.org/page/Lentigines. Accessed December 1, 2018. 10. Agbai O, Hamzavi I, Jagdeo J. Laser treatments for postinflammatory hyperpigmentation: a systematic review. JAMA Dermatol. 2017;153(2):199-206. 11. Post-inflammatory hyperpigmentation. The Australian College of Dermatologists website. https://www.dermcoll.edu.au/atoz/post-inflammatory-hyperpigmentation. Accessed December 1, 2018. Q-switched neodymium:YAG lasers. Arch Dermatol. 1998;134(2):167-171. 13. Izikson L, Farinelli W, Sakamoto F, Tannous Z, Anderson RR. Safety and effectiveness of black tattoo clearance in a pig model after a single treatment with a novel 758nm 500 picosecond laser: a pilot study. Lasers Surg Med. 2010;42(7):640-646. 14. Herd RM, Alora MB, Smoller B, Arndt KA, Dover JS. A clinical and histologic prospective controlled comparative study of the picosecond titanium:sapphire (795nm) laser versus the Q-switched alexandrite (752nm) laser for removing tattoo pigment. J Am Acad Dermatol. 1999;40(4):603-606. 15. Wang CC, Sue YM, Yang CH, Chen CK. A comparison of Q-switched alexandrite laser and intense pulsed light for the treatment of freckles and lentigines in Asian persons: a randomized, physician-blinded, split-face comparative trial. J Am Acad Dermatol. 2006;54(5):804-810. 16. Negishi K, Akita H, Matsunaga Y. Prospective study of removing solar lentigines in Asians using a novel dual-wavelength and dual-pulse width picosecond laser. Lasers Surg Med. 2018;50(8):851-858. 17. Artzi O, Mehrabi JN, Koren A, Niv R, Lapidoth M, Levi A. Picosecond 532-nm neodymium-doped yttrium aluminium garnet laser—a novel and promising modality for the treatment of café-au-lait macules. Lasers Med Sci. 2018;33(4):693-697. 18. Adatto M, Amir R, Bhawalkar J, et al. New and advanced picosecond lasers for tattoo removal. Curr Probl Dermatol. 2017;52:113-123. 19. PicoWay 510(k) clearance for tattoos (K142372), October 2014. 20. 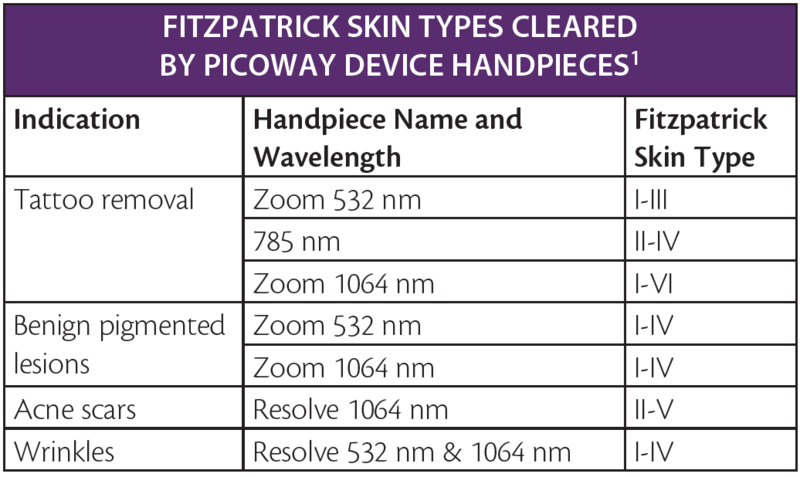 PicoWay 510(k) clearance for benign pigmented lesions (K150326), April 2015. 21. PicoWay 510(k) clearance for acne scars (K162454), February 2017. You’ve reached the end of this issue. Check out more great articles.